In addition to providing relief in areas of need overseas, there are many Muslim organisations providing help where it is needed in Britain. For Muslims in need the first point of contact is the family, who are approached when one is in need. This is usually effective and provides relief that is close and heart-felt. Providing help is a duty in Islam, however it is not always possible for the family to provide all the help that is needed to other family members. Young people may need help from their parents and parents (especially the elderly) may need help from their grown-up children. Allah stated: “We have enjoined upon man kindness to his parents.” (Qur’an 46:15) It is not always possible for families to provide this help fully as they may not have the skills or the resources. So the community steps in to help. Most Muslims in need of help will turn to their local mosque community. Here they will find a community prepared to give advice, education or if necessary material needs. The mosque is likely to serve as a community centre for local Muslims and the mosque committee shares the responsibility for the well-being of Muslims in its locality. The Salafi Mosque, Small Heath, in Birmingham: offers many services to the local Muslim community. These range from family counselling and religious knowledge services to evening school for children and community classes for adults. In addition, they offer help and support to people who are suffering through sickness, bereavement or the effects of poverty. Warning against extremism and terrorism was seen as religious duty long before violent acts were perpetrated in Europe. The work continues. The Salafi Mosque and Islamic Centre was opened in 2001 with the intention of giving the community a place of worship and to serve their needs. It does not refer to itself as an “organisation” but simply as a Mosque and Islamic Centre. It aims to improve understanding of Islam by holding local, regional and national events and conferences that are open to all people to attend. The Salafi Mosque aims to educate people and give them an understanding of Islam upon the way of the Prophet and his Companions. Young people are encouraged to take advantage of the provision the Salafi Mosque and Islamic Centre makes for their education and welfare. This includes Muslims learning about their faith, as well as non-Muslims learning about Islam in the hope that they discover the beauty of the Islamic faith, and to remove prejudice and Islamophobia that becoming widespread in the West. Islamic material is sent regularly to schools, universities, colleges, prisons and other organisations to assist those in need and those who wish to learn more about Islam. The hope of the Salafis is that by educating people about Islam, it will prevent future problems caused by lack of understanding and prejudice (sometimes referred to as Islamophobia). The location of the present Salafi Mosque is in the heart of Small Heath, Birmingham. It is ideally placed within a bustling Muslim community, just behind the Coventry Road that leads into the city centre, whilst in the opposite direction lies Birmingham International Airport within a twenty-minute drive. At present over a thousand people visit the Mosque weekly for prayers, classes, Qur’an lessons and the Friday Sermon. There are several conferences held a year attended by thousands. The Salafi Masjid has its own website: SalafiMasjid.com and SalafiSounds.com where one can find beneficial articles, prayer timetables and upcoming events. The local community benefits immensely from such websites. Mosque classes and lectures are broadcast through an online radio station: SalafiRadio.com – This way people from all around the world can tune in and listen to speeches, classes and Friday sermons. Conferences regularly have over three thousand attendees with thousands more listening online from every corner of the world. The Salafi platform is used to cultivate a balanced approach to Islam – calling people to practice Islam without extremism and without neglect. Behind the Mosque, on Coventry Road, there is a “Salafi Bookstore” which was established in 1997 selling hundreds, if not thousands of titles of authentic books and audios. Books are sent all over the world explaining the Salafi faith. The bookstore too has an online presence called SalafiBookstore.com – Other websites worth noting that have aided the Salafi message is SalafiSounds.com – a free audio download website that regularly has 3-6,000 visitors a day. 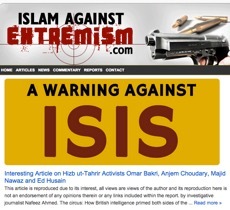 There is also an excellent website against extremism, called IslamAgainstExtremism.com. There is also a publishing house, called Salafi Publications which has produced millions of free leaflets in explanation of Islam and the Sunnah. People regularly donate to help this cause since it is seen a vital part of building vibrant Muslim communities in the West, communities that are fully integrated yet maintain their faith and heritage. A faithful Muslim spreads the good news of Islam through the teachings of the Qur’an and Hadeeth: “Give glad tidings and do not cause people to flee, make things easy and not difficult.” Salafi Publications has spent 20 years spreading Islam in a welcoming manner (which is proven by the vast number of attendees at their conferences) and it continues to do so – and all praise is for Allah. Explain the work of Salafi Publications and the Salafi Masjid. Do you think educating people about Islam may remove problems in the future? Give your reasons. Helping others is a duty in Islam. Do you think helping others should be a duty upon all people? Give a reason. 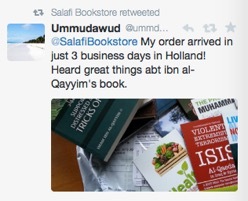 Why is it important for Salafi Publications, Salafi Bookstore to spread its message online? List some of the websites of the Salafi community in Birmingham.